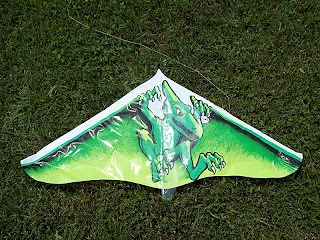 Here are some pictures of a Terror Saurus™ kite. It appears to be an image of a creature based on the flying reptile Pterodactylus. The Pterodactylus lived in the Jurassic Period and it's fossil forms are found in Bavaria, Germany. An adult was thought to have a wing span of about 1.5 meters. This kite has a wingspan of just over 1 meter (42 inches). It was manufactured in the United States by Gayla Industries Inc. of Houston, Texas, USA. 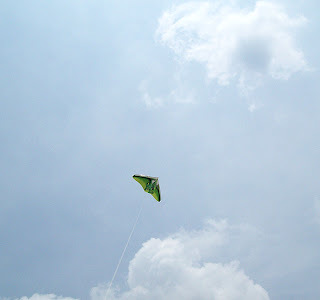 My kite was bought at a neat little store called HobbyTown USA located off Shelbyville Road, in Louisville, Kentucky (see web page). It costs $2.99 US. 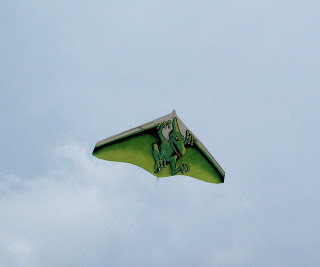 Kites originated in China in maybe 500 B.C. Learn more at Wikipedia. TM - Gayla Industries Inc.